* A lot of pundits are suggesting that if Trump wins Iowa and New Hampshire, he’ll probably win the nomination. But when it comes to Sanders, they don’t necessarily think that’s the case. 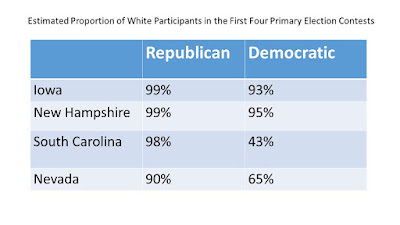 In order to demonstrate why, Keith Humphreys put together this chart demonstrating that the first two caucus/primary states are representative of Republicans. But when it comes to Democrats…not so much. * Earlier today I was wishing that someone could give me an analogy with a little more umph than “pot calling the kettle black” to characterize the idea of Trump (recently endorsed by Sarah Palin) calling Glenn Beck (campaigning with Cruz) a “wacko.” Then along comes Lindsey Graham. President Obama’s landmark climate change rule for power plants can move forward while its opponents challenge it, a federal court ruled Thursday. The Court of Appeals for the District of Columbia denied a request by West Virginia, dozens of other states and various energy interest groups to put a judicial stay on the regulation, saying the challengers didn’t show that the stay is needed. * Perhaps I should compile a list of “Nancy’s rules for observing political campaigns.” One that would be sure to make the cut goes like this: Whenever an underdog candidate says that the leader is afraid of them, it is a sure sign of desperation. Cue Jeb Bush. * For anyone who would like a sweet story, how about the one where President Obama turned down a request to give the commencement address at Malia’s graduation.